Dingle town is a busy, bustling town with colourful shop fronts, great restaurants and an incredible fifty-two pubs! Dingle Harbour is central to the town’s activity. 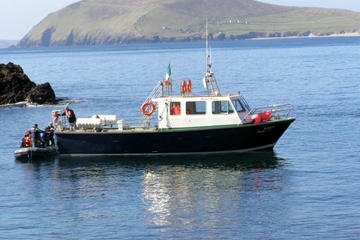 There are many boat operators offering sea cruises and passage to The Blasket Islands. Dingle is famous for its very friendly Bottlenose dolphin named Fungie who has been in Dingle Bay since 1983. The Dingle Plan for Marie Antoinette . . . In late 1792 a daring plan was conceived in Dingle to rescue Marie Antoinette from her prison in Paris and whisk her away by ship to Dingle Harbour. There is documentary evidence to support the story including tales of a secret tunnel from the harbour to a house in the town prepared for her arrival. The Queen, however, would not leave her husband and was beheaded on 16th October 1793.